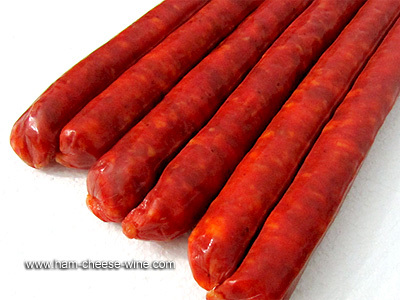 The Chistorra is the great Navarre sausage. 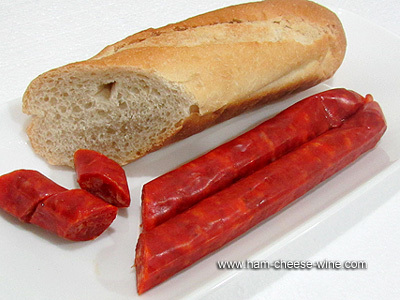 Originating in this province (Navarra), it is a fresh, reddish or deep red sausage, of thin gauge and each with a weight of 0.5 pounds. Pretty similar to but thinner and longer than the chorizo, the Txistorra, as it is called in Navarra, is made from fresh minced pork plus garlic, salt and paprika. With a Basque - Navarrese and Aragonese origin, though it is said to be native to North West Navarre and Guipúzcoa, the Chistorra is a sausage that is usually cured for a short time. 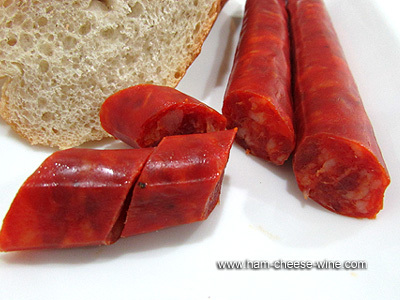 It is made using the same ingredients as for the chorizo, but its fat content is much higher, in some cases reaching 70% fat, though it usually has 50% to 55% fat, and is cased in sheep gut, which provides smaller diameter than chorizo, without ever exceeding 25 mm. The Chistorra is made at almost every butcher shop of Navarra, where the climate favors natural drying. In the Txistorra manufacture there is no need to use smoke. With a short curing period between 1 to 5 days, it is presented in a fine straight gut. The history of Navarra is linked to its recipe for and quality of Txistorra produced there. It is in this place where the most favorable climatic conditions for natural drying are present. The folk saying goes as that the day after the pork killing the meat and guts were chopped and marinated and let stand a few days, then the guts were filled and placed in a rod on the roof for their maturation. Chistorra was not just born in Navarra, but it is always present in its fairs, festivals or traditional meetings. There is not a December 21 (day of St. Thomas) without its typical meal of talo, Chistorra and cider. The most common way to consume the Chistorra is fried with a drop of olive oil over high heat but without being too crisp, on a skewer or snack, accompanied only by a piece of bread. But there are so many ways to eat the Chistorra as imagination allows us. In an omelette, with potatoes and a few broken eggs, in puff pastry, as part of a stew, with cooked white beans, skewered with almost anything else, in a casserole with cider. As we can see, Chistorra, a typical product of Navarra, has a thousand ways and each more appetizing, making it a sausage of excellence for our kitchen. Why add Chistorra to my diet? 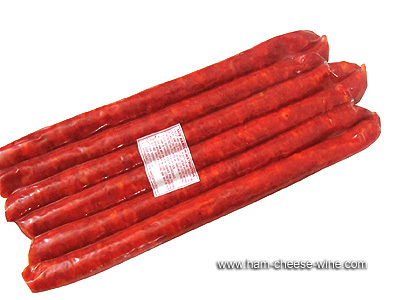 The Chistorra is a fresh sausage, bright red, thin gauge, made with the best raw materials and ripened in the magnificent climate of Navarra. 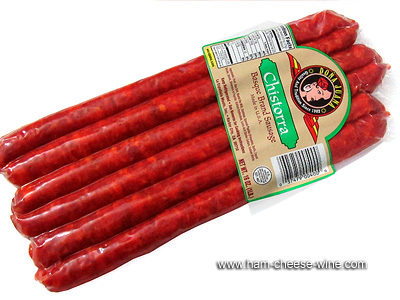 As a result you get a kind of thin chorizo sausage, with a nice texture and intense flavor, but still soft, very appealing to any audience. 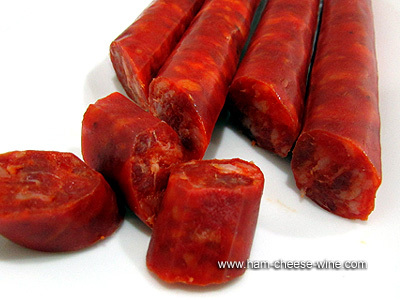 To manufacture a Chistorra, cold pork meat is chopped and mixed with paprika and garlic, and then it is cased in a sheep gut which gives the desired thickness. The secret of the making of Chistorra in Navarre is in the selection of raw materials. Paprika should be of prime quality, the most used being that with denomination of origin La Vera. Other aspect to care for regarding quality is the amount of garlic to put in the mixture before casing.